We moved into our new house knowing it needed A LOT of work!! But we weren't quite prepared for how annoyed we would feel living in a house that needed so much work. But when you go from living in a house that was practically finished and to your taste, to a house that got stuck in the 70's it comes as quite a shock. Delilahs bedroom quickly became the biggest annoyance. Not only were the walls painted bogey green but Peggy (our Dachshund) must have thought the ugly green carpet was grass and pooped in there multiple times a day! Gross! Something needed to be done ASAP. Her bedroom in our old house was just painted cream with some butterfly stickers, not a lot of thought went into it but then again it was barely even big enough to be considered a cupboard. So there wasn't much room to get creative. The fact she has never had a room that has been done specifically for her made me want it to be that much more special. Anyone that knows Delilah, knows that wherever she goes Peter Rabbit goes too! She's obsessed. The filthy, dog nibbled soft toy comes everywhere with us (except the bath unfortunately!) 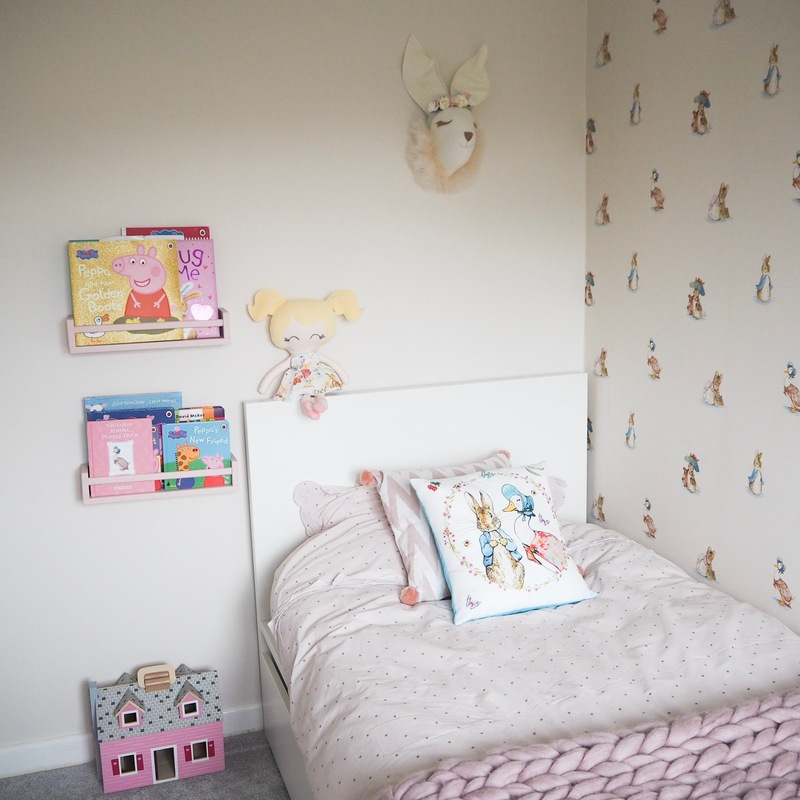 So I thought it only right to give her a Peter Rabbit bedroom! We had a plasterer come to plaster the ceiling as textured artex is just not our thing, but the walls themselves weren't actually too bad so we managed to avoid having to have the whole room done. Usually we do the decorating ourselves but we both HATE painting with a passion and aren't particularly good at it so we decided to have a painter and decorator come to do it for us this time which was AMAZING! 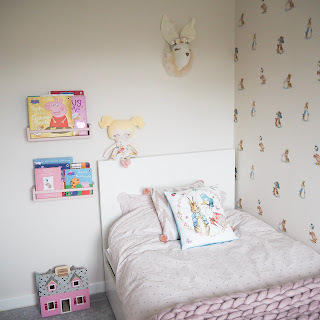 We chose some beautiful Beatrix Potter wallpaper which you can find here and knew it would be just perfect for her new room. We then took a piece of the wallpaper into B&Q and had a pot of Valspar paint matched exactly to the background of the wallpaper to keep the room nice and light. Her room is still only small but has a much nicer feel to it than her old one. The ugly green carpet was ripped up by my husband who happens to be a carpet fitter which is handy! And quickly replaced with a pale grey bleach-able carpet - definitely needed when its a room for a little whirlwind of a 2 year old. When the painting and carpet was all finished we took a trip to Ikea and came out £700 worse off!! How do you even spend £700 in Ikea!! But we did buy Delilah a new bed. A full single size bed with two huge pull out drawers underneath - perfect for a small room with very little storage. My favourite part is choosing all the little nick nacks. Her quilt set with the scalloped edges is from H&M. Book shelves are Ikea spice racks that I painted in a pale pink Valspar wood paint and chest of drawers are from Ikea Hemnes range. Dream catcher which I love is from a little Instagram shop called Nikki and Nancy. 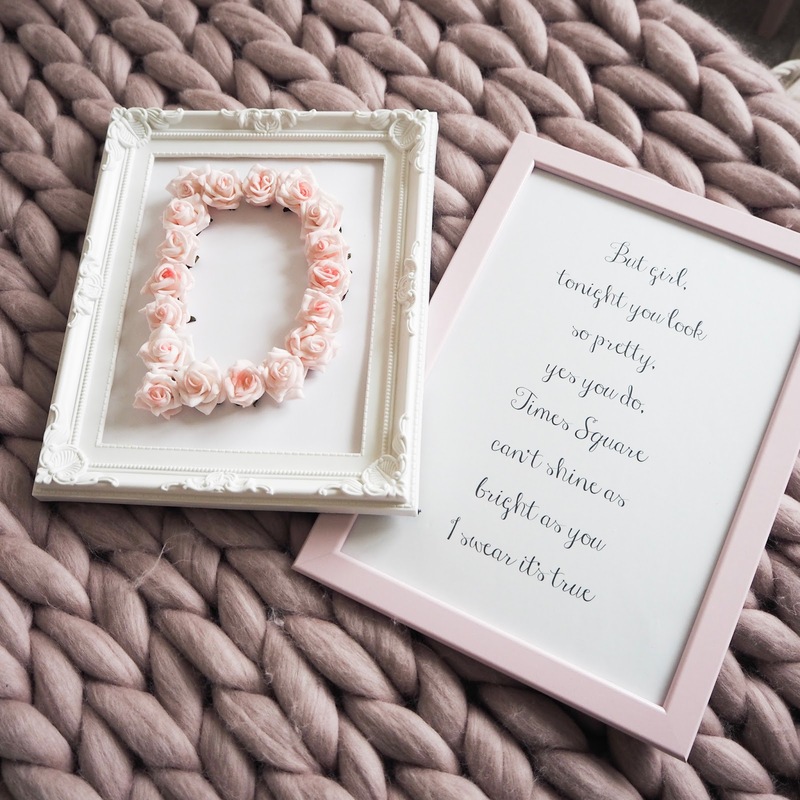 Rabbit Head is from a little Instagram shop called Claires Vintage Treasures. Pink Stag table is an up cycling project I did, painted in the same colour as the book shelves. Prints are from her old bedroom so can't remember where they came from. I can't wait to get started on the rest of the rooms but for now this is my favourite room in the house and Delilah definitely agrees!